Colossians 2:1 For I would that ye knew what great conflict I have for you, and for them at Laodicea, and for as many as have not seen my face in the flesh; 2 That their hearts might be comforted, being knit together in love, and unto all riches of the full assurance of understanding, to the acknowledgement of the mystery of God, and of the Father, and of Christ; 3 In whom are hid all the treasures of wisdom and knowledge. 4 And this I say, lest any man should beguile you with enticing words. 5 For though I be absent in the flesh, yet am I with you in the spirit, joying and beholding your order, and the stedfastness of your faith in Christ. 6 As ye have therefore received Christ Jesus the Lord, so walk ye in him: 7 Rooted and built up in him, and stablished in the faith, as ye have been taught, abounding therein with thanksgiving. LIVE WEBCASTING SUN. @ 10 and 11 A.M. 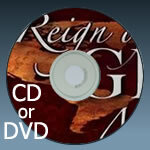 Considering a Donation to Reign of Grace Media Ministries? First of all, thank you for your generosity and your willingness to support our ministry. We are honored by the trust your gift demonstrates, and we are grateful for your commitment to God's Word and its teaching through DVD’s, CDs, radio, television, and the Internet. This ministry is provided free of charge and funded solely by donations. All gifts to Reign of Grace Media Ministries are tax deductible. For those who live in or near the southwest Georgia area, we invite you to attend our church.